On the one hand, I am very excited about “My Roanoke Nightmare”. As a history buff, the idea that the talent team at American Horror Story are going to tackle one of the great mysteries of Americana, is nothing short of a pure thrill. On the other hand, there is the way they have decided to take the theme. 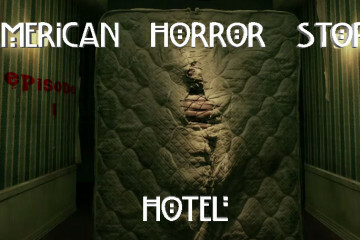 Now I get it, American Horror Story has always paid tribute to the “sub-genres” of horror. In that respect, I guess it was only a matter of time before the pseudo reality “haunting” show became a part of the ethos that American Horror Story would draw from. TV shows like “Ghost Hunters” and Films like “Paranormal Activity” having been filling the coffers of studios and nightmares of fans for years now. But is the format enough for a whole season? How are they going to keep us interested after a few episodes? I am not sure they can. So let us get to the actual review. This season (so far) seems to be about Matt and Shelby. 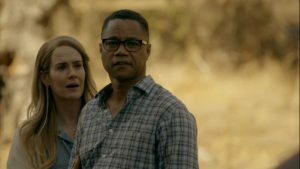 (played by Lily Rabe and Andre Holland in the “real world” and Sarah Paulson and Cuba Gooding Jr in the “reenactment”). Matt and Shelby lived in Los Angeles where Matt worked as a traveling salesman, and Shelby was a Yoga coach. After some young hooligans attacked the couple one night in some sort of a gang initiation knock out game, they decided to move away from Los Angeles. So strange things start happening almost immediately. Matt assumes it is the “racist hillbillies” trying to scare them away. But since the cops won’t do anything, Matt installs security cameras and calls his sister Lee to stay with Shelby as he goes on a sales trip. Lee (played by Adina Porter in “real life” and Angela Bassett in the “reenactments”) is a former cop who go addicted to pain pills after being shot on the job. She lost her job, but is now clean and sober. Lee doesn’t like Shelby much, but she loves her brother, and shows up to help him. That night, Shelby and Lee here a noise in the basement, and decide to go investigate. I am having trouble understanding why a former cop, who things that racist hill billies may be in the basement, would investigate, yet leave her gun upstairs… Down in the basement, they find a TV on and it is playing a “found footage horror movie” type tape. At the same time, Matt’s phone goes off to inform him that the cameras he set up outside the house have seen movement. He looks at the live feed and sees men with torches entering his house. He rushes from his hotel room and heads home. 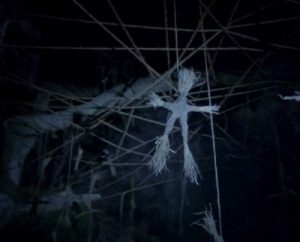 When Shelby and Lee emerge from the basement, there is no one left in the house, but whoever was there strung up rope and little “Blair Witch” dolls all over the staircase. Matt gets back home and Shelby and Lee show him the dolls and the video. 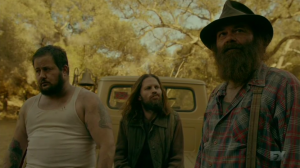 Shelby wants to leave, but Matt is sure this is those hillbillies trying to scare them. Shelby isn’t having any of it, so she runs off and gets in the car and starts to drive away. On the road away from the house, Shelby hits Kathy Bates who is walking in the middle of the road dressed like she is Amish. Shelby stops the car and sees Kathy Bates (who’s character is named Thomasin White according to the IMDB page). Thomas gets up and wanders off into the woods. Shelby gives chase and soon finds herself lost and disorientated in the woods. Shortly, she roams into a spiderweb of rope with the little “Blair Witch” dolls from earlier hanging from them. I guess the next episode will continue this. As I said at the beginning of this review, I am not a huge fan of this type of story telling. In my opinion, there is a reason why shows like unsolved mysteries pioneered this intercutting reenactment and talking head type format. It was because the strength of the eyewitness testimony gave credibility to the story, but it was visually boring, so the reenactments were added in to make the show exciting. Some low budget horror films started adopting the _eye witness testimonials” mostly because talking heads are cheap and easy to shoot. 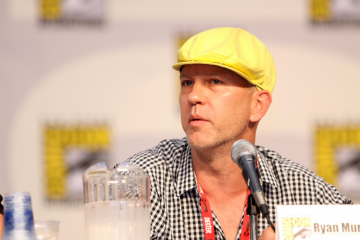 In a well budgeted show like American Horror Story, they “eye witness” looses all credibility because we know it is the same actor that played a different part last season. So if the talking heads have no credibility, and the show isn’t trying to cut costs, then all that is left in these scenes is boring. I mean seriously, isn’t that the first thing they teach you in “Writing for the Screen” class: Never say it if you can show it. *I do think Lily Rabe is terrific in American Horror Story, and she was severely missed last season, but loose the talking heads.